TAKE THE ONE O ONE, 3 wins, 2 to 3, 2018, Champion California-bred Three-Year-Old Male, $341,526, Real Good Deal S., Snow Chief S., 3rd FrontRunner S. (Gr. 1), Echo Eddie S.
HECK YEAH, 4 wins, 2 to 3, 2018, $309,833, Echo Eddie S., California Cup Derby, California Cup Turf Sprint S.
Accountability, 3 wins, 2 to 4, placed at 5, 2019, $230,191, 3rd Unusual Heat Turf Classic S. twice. Accomplishedsister, winner at 2, 2018, $52,280, 2nd California Thoroughbred Breeders’ Association S, Juan Gonzalez Memorial S.
Alsatian, 3 wins, 2 to 4, placed at 5, 2019, $189,404. Ragazza Di Vola, 5 wins, 3 to 4, 2018, $101,471. Acclimate, 3 wins, 4 to 5, 2019, $79,401. Thermopolis, winner at 4, 2018, $70,450. ACCLAMATION, 11 wins, 2 to 6, $1,958,048, Champion Older Male 2011, California Horse of Year 2011 and 2012, California Champion Older Male and Turf Champion 2011 and 2012, Eddie Read S. (G1) twice, Pacific Classic (G1), Charles Whittingham Memorial H. (G1) thrice, Clement Hirsch (G2), Jim Murray H. (G2) twice, 2nd Ralph M. Hinds Invitational H. (L-Fairplex Park), 3rd Hollywood Derby (G1 ), Del Mar Derby (G2), Strub S. (G2), San Gabriel H. (G2). ACCLAMATION (c. by Unusual Heat). Champion see below. Shehastheritestuff (f. by Unusual Heat). 4 wins at 3 and 4, $214,797. Madeoftherightstuf (g. by Perfect Mandate). 2 wins at 4, $69,900. Particleacelerator (g. by Cyclotron). Winner at 5, $51,284. Desiresoftheheart (f. by Unusual Heat). Winner in 1 start at 4, $33,600. California Cup Juvenile Fillies S.[LR] (OSA, $25,000), Las Madrinas H.
Starlite Style (f. by Unusual Heat). 3 wins at 4, $206,313. Bella Style (f. by Unusual Heat). Winner at 2, $33,690. Flying in Style (f. by Flying Sensation). Winner in 2 starts at 4, $14,820. Trial S. [L] (CD, $68,656). Sire. Premiere Flyer (g. by Vronsky). 2 wins at 3, $67,890. 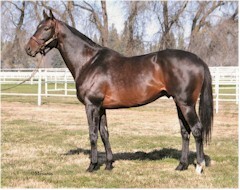 First Class Flyer (f. by In Excess (IRE)). 2 wins in 4 starts at 3,$60,700. Flew First Class (f. by Royal Cat). Winner at 3, $30,720. Accommodation (f. by Unusual Heat). Winner in 1 start at 2, $28,800. Atta Boy Pete (g. by Perfect Mandate). 9 wins, 2 to 7, $261,145. A New Trend (g. by Vronsky). Winner at 3 and 6, 2018, $54,440. Stylistic (f. by Cyclotron). Winner at 7, $43,237. Tates Mandate (g. by Perfect Mandate). 8 wins, 3 to 5, $68,501. Second Look (f. by State Performer). 3 wins at 4, $28,950. Like His Style (g. by Lucayan Prince). Winner at 3, $21,180. Mare Donna (f. by Bold Badgett). Winner at 3 and 4, $35,521. POSHSKY (g. by Vronsky). 13 wins, 3 to 8, 2018, $714,118, Berkeley H.
STYLISH WINNER (g. by Obraztsovy). 5 wins, 2 to 5, $791,725, San Vicente S.
$20,000), On Trust H. [LR] (HOL, $20,000), etc. Cup Classic H. [LR] (SA, $45,000), Khaled H. [LR] (HOL, $9,000), C. B.
Afflerbaugh S. [LR] (FPX, $6,000). Vista d'Aquila (g. by *Golden Eagle II). 3 wins at 3 and 6, $33,455. Gentleman's Luck (c. by Lucky Mike). Winner at 2, $25,220. Les Gentil Hommes (g. by Cozzene). 4 wins at 4 and 5, $52,736. Platinum Crown (c. by Jules). 2 wins at 3, $26,270. Sixteentwenty (g. by West by West). 3 wins at 3 and 4, $20,403. Sneer (f. by Grand Slam). Winner at 3, $15,720. Producer. The Lady Has Class (f. by Snow Chief). Winner at 3 and 4, $15,525. Stylish Road (g. by Kennedy Road). Placed at 3 and 4, $17,425. -Turn to Kerlan (c. by Turn to Mars). 12 wins, 3 to 5 in Mexico. -Marichu (MEX) (f. by Executive Crown). Winner at 3 in Mexico, $3,309(USA$). -Filo (c. by Cuchillo). Winner at 7 in Mexico. Winning in Style (f. by Silveyville). See above. RACE RECORD for Acclamation: At 2, one win; at 3, one win, twice 2nd (Ralph M.
$24,000)); at 5, Champion older horse (2011), 5 wins (TVG Pacific Classic S.
11 wins, twice 2nd, 6 times 3rd. Earned $1,958,048. Acclamation sires 2018 stakes winners HECK YEAH and TAKE THE O ONE.